Walk and explore the Island with its pretty gardens. Swim in 3 sparkling swimming pools. Direct access to beach or lagoon from all Cottages. Bird-watching on the lagoon from all of the jetties on Woodbridge Island. Beautiful big Koi fish pond with Gazebo from where you can feed the fish with food purchased from the Island Administration Office. On the beach fly a kite, surf the white rolling waves, windsurf or kite-surf. Beautiful golden sunset walks on virgin white beaches or just look at the awesome Table Mountain with the lights of Cape Town city twinkling back at you, Robben Island, sailing ships and cruisers passing by. 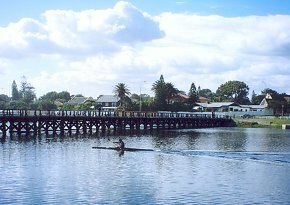 Take a stroll across the lagoon on the historical wooden bridge, the oldest in South Africa. Shop until you drop in nearby Malls and Boutiques. Walk to the only true Links 18-hole golf course club. Enjoy sundowners (drinks must be the cheapest in town) in their pubs and meet friendly people. Walk to "Maestros on the Beach" (adjacent to the golf course) and savour their culinary delights. Outside the entrance gate there are small restaurants for light meals.